Hey everyone, it’s Typo Tuesday, and this week, we’re bringing you a grammar gaffe courtesy of Walgreens. Who Needs Grammar? At Least We Can Count…Right? When picking up a prescription at Walgreens the other day, this lovely sign caught my eye. Of course, the double spacing between sentences bugs me (which is still regarded as a matter of preference, even though single spacing is the accepted convention of Chicago, AP and MLA) but I’m not that picky (unless, of course, the content is going on our site, in which case I am definitely a bit heavy handed). No, the double space isn’t the issue that really irks me. There’s also an issue with the tenses (can you find it?) but that’s not the biggest problem, either. Basically, this sign is a huge mess and needs to be burned, but the issue I’m referring to is singular in nature…or is it plural? In the sentence, “Some prescriptions may require additional processing in order to validate it with your physician,” the writer has chosen to change from plural (“some prescriptions”) to singular (“it”), and continue discussing a singular prescription throughout the remainder of the statement. Which prescription is the physician validating? Can I choose? How Should This Be Corrected? The writer could correct the sentence to state, “Some prescriptions may require additional processing in order to validate them with your physician,” but then the issue would still remain for the rest of the statement. 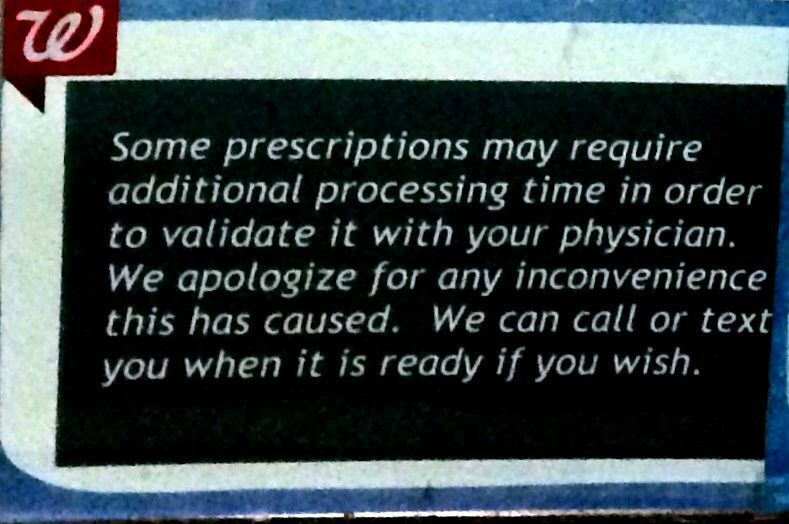 Instead, “Your prescription may require additional processing in order to validate it with your physician” is an okay choice. And I say “okay” because the sentence is such a train wreck that I would just rewrite it. We’ve learned, first, that whoever wrote this sign should never be allowed to do so ever again. Second, counting is important. Especially in pharmacies. And third, if in doubt, scratch it out. Rewriting is sometimes the very best answer.